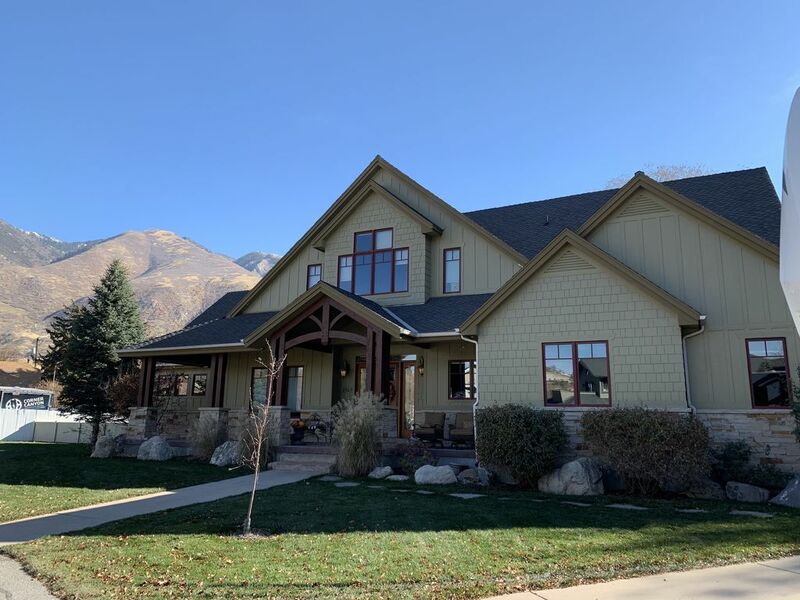 Ideal location for your Utah getaway, near ski resorts, trailheads, light rail, and Silicon Slopes. This is a private 2,500 sq. ft. basement apartment with a separate entrance, featuring 2 bedrooms, 1 Jack & Jill Bath, Kitchenette, Gym, Theatre Room, Hot Tub, and postcard views. Bedroom #1 offers a queen bed and spacious Bedroom #2 features a queen bed and 2 adjustable twin beds, that convert to King. All rooms are equipped with Smart TV. Relax and unwind in the gym and theatre room, or just cozy up next to the fireplace. After a great afternoon on the slopes or trail, relax in your six person hot tub. You are renting the complete basement (approx 2,500 sq. ft.). The basement is separated from the main level and is secured (lockable) and private. Pet's live on this property. We have a unique neighbor, check out our Zebra, Emu's, Horses or collect some fresh eggs for the morning. You have complete access to your living space. Pet fee of $10.00 per day per pet. As we want to you have a memorable experience, we will rarely be seen but are available for any issues as well as any recommendations on activities, dining, or shopping. We are located adjacent to the Porter Rockwell walking trails, World Class Corner Canyon Bike Trails and Flight Park State Recreation (Hang Gliding) Area. We have bikes for your use and have a private ski/bike locker available. Amazing mountain views right outside the window! On-site, including free-weights, cardio equipment and television. Small Kitchenette, includes Coffee Maker, elec. tea pot, infrared oven, toaster, pizza oven, 2-burner hotplate, various pans bowels, blender, waffle iron, Copper Chef hotplate. Televisions in every room. Movie Theatre equipped with many movies. Television in exercise room. Comcast Music with ceiling speakers. Large extensive DVD collection, family and kid friendly. Foosball Table, children's toys, book nook/play nook, family board/card games. Large selection of children's toys. Relaxing area with amazing mountain views. NEW, private outdoor hot tub. Amazing value. Better than advertised. Property was even better than described. So many little things were included that normally don't get included in house rentals (towels for bathroom, special towels for hot tub, TOWEL WARMER NEXT TO THE SHOWER, very soft bathrobes, soaps, q-tips, usb charging ports, lockable area for skiis next to your car, and many other things). Tom (the owner) was very responsive on text from the day we booked. He was helping us with everything we needed or asked for. I let him know that the multi-usb charging station he had was not working in just 1 of the 3 ports. He had a new one waiting for us when we got back from skiing. 100's of movies available on DVD. We actually used the Netflix and Amazon prime links in the theater room to watch some of our favorite series. The sound in the theater room is quite good. I heard sounds in the movie "Inglorious Bastards" that I didn't know existed (Ceiling Fans turning in the final climax scene). Nest controller for heating and AC was very nice. I'm sure many people are worried about it being a basement. However, it is very spacious and has tall ceilings. Hardly ever heard noises from upstairs...even when we did, it was no louder than typical hotels or townhomes. Views at night from the hot tub were awesome at night. The moon would rise above the mountains and light up the entire area. My kids LOVED the shower. Huge shower with plenty of hot water. It has a steam room size bench to sit on. We skiid at alta and snowbird for 3 days and the drive was 28 minutes. Very beautiful drive through an amazing neighborhood of $10 Million+ houses (if you don't have an envy issue). Only a few minor opportunities or things to consider. The steps going down to your private entrance are beautiful rocks. They are quite big steps. Just be careful and hold the handrail. More of a pain just for carrying your bags in and out (or if you are exhausted from skiing all day). The sink in the bathroom is tall. Smaller kids may just need help reaching over it (they normally need help with any sink height anyways). We will stay here again any time we come to Salt Lake City. The value is unbeatable. Easily worth 50% more than what was charged. Wow, thanks for your amazing review. We certainly strive to provide our guests with the best possible experience and am so delighted that you did. We would certainly love to see you back again soon. This was great place to stay for our group of four guys on a ski trip. There was more than enough room. Each of us had our own bed. We definitely enjoyed post-ski hot tubbing and video watching in the theater room. Though it doesn't include a full kitchen, there was enough equipment for us to do all the cooking we wanted to do. It's in a neighborhood, but it's less than five minutes away from a grocery store and restaurants. Best of all, we were parked at both Snowbird and Alta in 30 minutes or so. The only downside is that there's only one bathroom, but the positives far outweigh that one negative here. I highly recommend this stay. Thanks so much for your kind words. We really did enjoy having you all and would love to see you again soon. Thanks so much for staying with us, we truly enjoyed having you and would love to see you back when you're in the area again. We would definitely rent this place again. My husband loved the theater room. It was a centrally location so my husband got to ski lots of ski areas!!! Thank you so much for staying with us. We really did enjoy you all and would love to see you back again soon. Great stay for a ski trip. Great stay for a ski trip for two buddies. Owner is super nice and accommodative. We had an awesome time. Thanks Nick, we really did enjoy having you two and glad the skiing was fantastic. Hope to see you again in the future!